You know, when we wipe away all the blame and excuses…we often have a much bigger role to play in the way our life unfolds. What I mean here is that the ability for us to control events we’re a part of, is something we often assume is not available to us. But it really is. Let’s start by recognizing that things happen TO people. They happen to good people, bad people, and perhaps those we would see as deserving and undeserving. But if we can legitimately be the best WE can be…especially in working on OUR limitations, then we’re going to see more growth and better things happening. One of the most important things to realize is that we’re going to have what Zappos founder Tony Hsieh calls collisions. That is, engagement with others. And the quality of those engagements leads into more or less like, trust, and support. So when we think of our life as a series of at home, community, work, and online engagements – then the quality of those engagements becomes very important. Not just for how others see and interact with us, but with how we cumulatively grow and benefit through them. And that leads me into today’s topic…that is.., the single best tip I recommend for engagement. As you know, I look at civility as a learnable and improvable skill. It’s not something that people JUST HAVE or DO WELL…but if you do have it and do it well, you’re going to find yourself in better control of yourself and feeling more inspired when you meet and communicate with others. So while there is no one shot cure for being civil – this tip will help you not only get started, but it will truly create an excellent base. It’s one thing that you can work to improve on, and master. When you do that, you’ll find yourself engaging others with less stress and pressure. When you are entering into a conversation or engagement, YOUR PRIMARY FOCUS must be squarely on FIRST seeking to genuinely listen and genuinely learn from others. NOT to seek to control them. Seems straightforward…but you’ll find it’s often not easy – especially when you and others have strong differences of views or opinions. On how to handle a challenge at work, on a hot news topic, a political issue, or perhaps an issue involving your partner, spouse or kids. I don’t care whether you call it being emotionally intelligent or just putting your ears in first gear and your mouth in second. The ability to enter into or even shift into an engagement where you first seek to listen, learn about, and understand others is a tremendous advantage for you in any communication – plus it helps you and others to grow. Now I want to be clear. I’m not talking about changing your views or compromising your opinions. 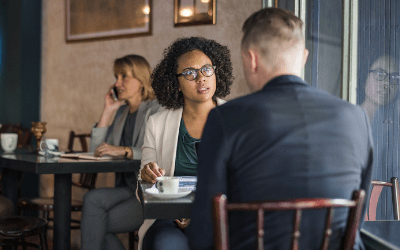 The engagement may even lead into some healthy back and forth debate – but done in a way where you can come out, even remaining in disagreement – but not shaming, blaming, name-calling or letting animus build up toward the other person. And guys…let’s not be silly here. I’m not talking about if someone pushes you, punches you, curses you, or does something that is outright inappropriate – such as harassment or discrimination. You don’t need to tolerate that – and there is definitely a time to disengage from any encounter where this occurs. But the majority of engagements that we have, are those that we can bring a healthier influence in. So I’m talking about the 95% of engagements, where if you’re a better listener, learner and genuinely understand another’s perspective (even though you may not agree) – that person is going to felt heard and appreciated. So you’re looking to consistently hit singles in the world of building inclusion. Not inclusion based on skin color, race, religion or some other legally protected class. But building inclusion by your behavior and manner of engagement – toward the diversity you both have in your views and opinions. To get started, you have to begin by working on yourself. Because you can start doing this, but when listening (for example)…you may find that you really AREN’T LISTENING. You’re hearing their words, but your brain is already preparing a retort to combat their point. That isn’t listening…and knowing the difference MAKES a big difference in result. And guess what? THEY will feel the difference. I always suggest going to WalkTheRidge.ORG and downloading some of the free guides and tip sheets. And of course I’ll plug in having them come to your company to help on culture. 1) Understand YOUR biases. Go online and search for top or common biases. I’m talking about confirmation bias, hindsight bias, and self-serving bias. These are all different, and these can often serve as a poor base for how you engage others. 2) Embrace mindfulness. This is not emotional intelligence…but it’s being aware. I find mindfulness especially important when really improving your listening and staying with the other person’s reason for view – especially when your emotions want to rise up and challenge them. 1) The single best tip for engaging others, especially when there are differences of opinions or views, is to enter into an encounter, or shift within an existing encounter that changes… as a listener, learner and in understanding the other person’s perspective. 2) You can still keep your views and opinions, without seeking to control or manipulate others to agree with you. In fact, if your opinion is firm and you’re truly emotionally healthy on the inside, you’ll be able to have the strengths of your convictions and remain far more pleasant during disagreements. 3) This tip is one of many – to help improve civility in you. And as you get better…we at WalkTheRidge strongly encourage you to share that with others – so that the practice can grow stronger in numbers and in culture. Appreciate you listening. Feel free to visit our show sponsor at WalkTheRidge.ORG.